On Saturday, March 8th I’ll be presenting a simulation of the situation in Ukraine using Command version 1.03. With me, will be Dimitris Dranidis and Michael Mykytyn of Warfare Sims. Stream starts at 11:00 AM PST. Status: offline To what end? A naval action seems a little pointless. They share a long border, why wouldn't the Russians invade by land? In any case, I hope this idiot president knows enough to keep us out of this mess. You cant cut the military down to a fraction of it's former power, and expect to take on Russia in it's own front yard. I can't imagine the US populous in general has any desire to send our troops into another conflict, particularly against a nation that still possesses enough WMD to wipe us all off the face of the Earth. Status: offline Too bad SECDEF today said he wants to kill A-10 once and for all. Even while a Computer Upgrade for the Fleet is being developed still. Status: offline Well, I'd say it was already used for it's intended purpose in Iraq and Afghanistan already- kicking arse and eating armor. 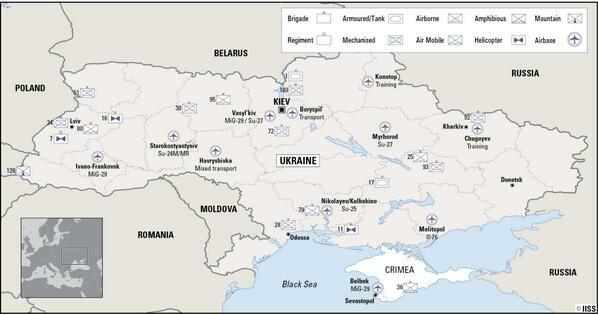 But versus a Russian tank rush into the Ukraine, we'd need a lot more than all the A-10's we have in the inventory. We'd need allies. And I just don't think there are many Europeans who have any desire to back our play against the Russians. We aren't talking about the Fulda Gap, we're talking about far Eastern Europe, where our old allies don't necessarily feel threatened by Russia. Our NEW allies, Poland, Romania, Czechoslovakia, Estonia, etc- are probably going to feel a little concerned, But I can't see Germany, Britain, Italy, or Spain doing much to help us if it came down to defending Ukraine from Russian bullying. Status: offline 345 (approximately) is more than enough to litter a grave yard of Russian Tanks into such a mess that they ain't going anywhere. This of course if you control the air. There isn't going to be any war with Russia over Ukraine. Status: offline If anything momentous does go down between Russia and Ukraine, we might get to finally see the big SAM systems, like the S-300 in combat. That would be worth the price of admission. Status: offline I love playing Command, one of my favorite things to do when I have some spare time. I love to jump in the editor and see what kind of odd, yet plausible, match ups I can create and what the simulated outcomes would be. In my time of testing and playing CMNAO, one thing has made itself brutally clear to me. Any kind of large scale action between peer nations is going to be extremely bloody for all participants. Status: offline Hey, I'm just tired of hearing Russians fan boiz talk smack all the time about how awesome their tech is, and they are going to blow every F-22, F-35, and B-2 out of the sky without taking their eyes off their vodka shot glass. I want to see just how RUSSIA STRONG!! !111!11 this gear really is. That said, as a Buddhist, I must agree with you... It's all fun and games until our loved ones stop coming home. I am reminded of drills we ran in my days as a skimmer, and we'd hear "All Hands, brace for impact!" over the 1MC, and the DC chief telling us to grab a horizontal, and bend our knees so the upheaval wouldn't break our legs too badly... And I'm thinking, I'm on a freakin' carrier- there's six other ships and a hundred aircraft protecting us! As I was to learn, the other ships were supposedly already burning or sunk, and we were the primary target. I'd look around at all my shipmates, and think of a Soviet missile the size of a bus slamming into the ship at mach 3. If we were lucky, they'd be conventional warheads, and maybe some of us would survive long enough to abandon ship- but we all were trained to fight the ship through an attack of nuclear-tipped missiles, and we all knew that even this giant carrier wasn't going to survive long under that kind of attack. If even one went off nearby, it would likely scram the reactors, probably smash the shafts and machinery, and we'd be left with emergency diesels, practically a sitting target. I was thankful that my battle station was on the aft hanger deck, dealing with radiation casualties. The last place I wanted to be was down in the plant, with all that irradiated super-heated steam, below the waterline. There wasn't very much chance of getting out of there alive. Status: offline I could see a naval scenario occurring quote easily. Russia plans on moving in Russian units to "suppress the mutiny". The US sends in a carrier group into the black see to serve as an aid to diplomatic warnings to Russia that an and intrusion into Ukraine will not be tolerated (although with the current administration it would be). Russia warns the US that any movement of a carrier group into the black see near Sevastopol will be considered an act of aggression. So the Navy conducts a freedom of navigation exercise and moves as close as possible to Sevastopol (while in international waters) to send a message that the US is serious. Russia responds by claiming the US has violated their territorial waters and attacks the US fleet. Status: offline Oh, I can definitely see the potential for a scenario- I'm just wondering what the Russians actually expect to accomplish IRL? They don't "own" the Ukraine, anymore, and four ships (Not even a Slava-class cruiser) is going to intimidate the Ukrainian people away from the desire to be free of Russian tyranny and oppression. You cant scare a person into submission forever, or beat them down enough to want to stay with you- they will eventually desire to be free, and will find a way. Or they will die, or kill you in the process of running away. The big concern here, is knowing how far the Russians are willing to go in this escapade, and understanding what we are actually willing to lose in backing the Ukrainians. The American public has grown weary of war, especially war against a nuclear superpower. The Ukrainians may just have to fend for themselves on this one, until the world sees them dying en masse, and actually steps in to intervene. Putin instructed his defence minister, Sergei Shoigu, to place Russia's military in a state of high alert for drills in the western military district, bordering Ukraine. The defence ministry denied the drills had anything to do with the political situation in Kiev, where the government of President Viktor Yanukovych was in effect toppled at the weekend. But the move comes amid increasingly forthright statements from Moscow that the rights of ethnic Russians in Ukraine are being infringed. 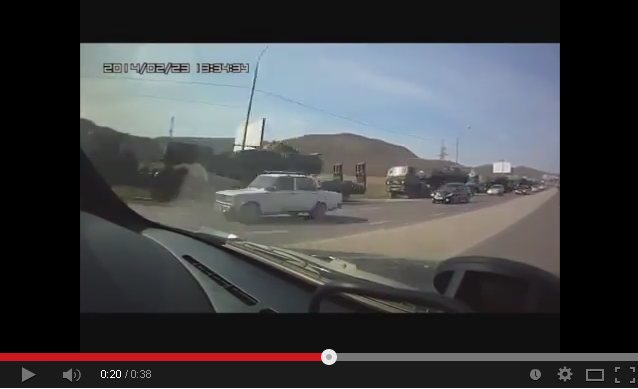 Status: offline Video taken on the 23rd from a dashcam near Novorossiysk. Quite a few BMP-2s! The Maidan council named Arseniy Yatsenyuk to become prime minister. The cabinet - to be voted on by MPs on Thursday - includes leading activists. "We are to undertake extremely unpopular steps as the previous government and previous president were so corrupted that the country is in a desperate financial plight," Mr Yatsenyuk told BBC Ukrainian. "We are on the brink of a disaster and this is the government of political suiciders! So welcome to hell," he added. MOSCOW (AP) — President Vladimir Putin on Wednesday ordered massive exercises involving most of its military units in western Russia amid tensions in Ukraine. Shoigu said Putin ordered the exercise Wednesday afternoon. During the first two days, the military will be put on high alert and some will deploy to shooting ranges. The actual maneuvers will start Friday and will last four days, he said. The exercise will involve ships of the Baltic and the Northern Fleets and the air force. Shoigu’s statement didn’t contain any reference to Ukraine, where tensions remain high following the toppling of Russia-backed President Viktor Yanukovych. Russia has questioned the legitimacy of the new Ukrainian authorities and accused them of failing to control radicals who threaten the Russia-speaking population in Ukraine’s east and south. A senior Russian lawmaker on Tuesday told pro-Russia activists in Ukraine’s Crimean Peninsula where Russia has a major naval base that Moscow will protect them if their lives are in danger. KIEV, Ukraine (AP) -- Russia ordered 150,000 troops to test their combat readiness Wednesday in a show of force that prompted a blunt warning from the United States that any military intervention in Ukraine would be a "grave mistake." The new government, which is expected to be formally approved by parliament Thursday, will face the hugely complicated task of restoring stability in a country that is not only deeply divided politically but on the verge of financial collapse. Its fugitive president, Viktor Yanukovych, fled the capital last week. In Kiev's Independence Square, the heart of the protest movement against Yanukovych, the interim leaders who seized control after he disappeared proposed Arseniy Yatsenyuk as the country's new prime minister. The 39-year-old served as economy minister, foreign minister and parliamentary speaker before Yanukovych took office in 2010, and is widely viewed as a technocratic reformer who enjoys the support of the U.S.
Across Ukraine, the divided allegiances between Russia and the West were on full display as fistfights broke out between pro- and anti-Russia protesters in the strategic Crimea peninsula. Amid the tensions, Putin put the military on alert for massive exercises involving most of the military units in western Russia, and announced measures to tighten security at the headquarters of Russia's Black Sea Fleet on Ukraine's Crimea peninsula. The maneuvers will involve some 150,000 troops, 880 tanks, 90 aircraft and 80 navy ships, and are intended to "check the troops' readiness for action in crisis situations that threaten the nation's military security," Defense Minister Sergei Shoigu said in remarks carried by Russian news agencies. The move prompted a sharp rebuke from U.S. Secretary of State John Kerry, who warned Russia against any military intervention in Ukraine. "Any kind of military intervention that would violate the sovereign territorial integrity of Ukraine would be a huge, a grave mistake," Kerry told reporters in Washington. "The territorial integrity of Ukraine needs to be respected." In delivering the message, Kerry also announced that the Obama administration was planning $1 billion in loan guarantees for Ukraine and would consider additional direct assistance for the former Soviet republic. Still, Kerry insisted that U.S. policy was not aimed at reducing Russia's influence in Ukraine or other former Soviet republics, but rather to see their people realize aspirations for freedom in robust democracies with strong economies. "This is not `Rocky IV'," Kerry said, referring to the 1985 Sylvester Stallone film in which an aging American boxer takes on a daunting Soviet muscleman. "It is not a zero-sum game. We do not view it through the lens of East-West, Russia-U.S. or anything else. We view it as an example of people within a sovereign nation who are expressing their desire to choose their future. And that's a very powerful force." Russia denied the military maneuvers had any connection to the situation in Ukraine, but the massive show of force appeared intended to show both the new Ukrainian authorities and the West that the Kremlin was ready to use all means to protect its interests. While Russia has pledged not to intervene in Ukraine's domestic affairs, it has issued a flurry of statements voicing concern about the situation of Russian speakers in Ukraine, including in the Crimea. The strategic region, which hosts a major Russian naval base and where the majority of the population are Russian speakers, has strong ties to Moscow. It only became part of Ukraine in 1954 when Soviet leader Nikita Khrushchev transferred jurisdiction from Russia - a move that was a mere formality until the 1991 Soviet collapse meant Crimea landed in an independent Ukraine. Still, while the exercises include most units from Russia's Western Military District and some from the Central Military District that spreads across the Urals and part of Siberia, it does not involve troops from the Southern Military District, such as the Black Sea Fleet and areas in southern Russia that neighbor Ukraine. This seemed to signal that Moscow does not want to go too far. By flexing its military muscles Russia clearly wants to show the West it must seriously consider its interests in Ukraine, while avoiding inflaming tensions further. The Tatars, a Muslim ethnic group who have lived in Crimea for centuries, were brutally deported in 1944 by Soviet dictator Josef Stalin, but have since returned. Any such deal will require a new prime minister to take unpopular steps, such as raising the price of gas to consumers. The state gas company charges as little as one-fifth of what it pays for imported Russian gas. The IMF unsuccessfully pressed Ukraine to halt the practice under two earlier bailouts, and halted aid when Kiev wouldn't comply. Vladimir Isachenkov reported from Moscow. Associated Press writers Maria Danilova and David McHugh in Kiev, Svetlana Fedas in Lviv, and Yuras Karmanau in Simferopol contributed to this report. Tension escalates between Moscow and Kiev after armed takeover, with Ukraine leader warning against Russian aggression. Ukrainian troops and police officers are on high alert, after armed men seized government buildings in the Crimea region of the country and raised a Russian flag over a barricade. Acting president Oleksander Turchinov told parliament on Thursday he had given an order for security structures to take "all measures" needed to protect citizens. 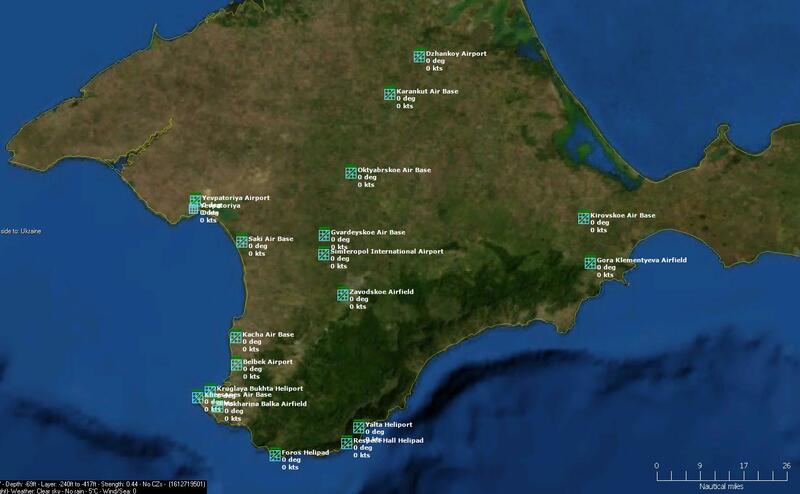 Part of Russia's Black Sea fleet is based in Crimea, in the port of Sevastopol. Turchinov told Russian forces in Crimea not to leave their base, saying any movement would be considered a "military aggression". The escalation in tension and rhetoric between Russia and Ukraine has steadily increased during the past months, but the overnight armed takeover could be a turning point in relations between the two countries. Interior minister Arsen Avakov said in a Facebook post on Thursday that "unknown men armed with automatic and machine guns seized the building of the Crimean government in Simferopol. Interior troops and the entire police force have been put on alert". The area has been cordoned off "to prevent bloodshed", according to news agency AFP. "Measures have been taken to counter extremist actions and not allow the situation to escalate into an armed confrontation in the centre of the city,'' Avakov said. Pictures from Twitter, also posted on Thursday, showed the Russian flag raised above the Crimean parliament building. Up to 50 men with weapons marched into the buildings during the night. There has been no formal response from Moscow to the latest developments in Crimea, but Russia's defence ministry has said its fighter jets are on standby. The country's foreign ministry said on Twitter it would "continue to defend in the international arena the rights of its compatriots, it will strongly and uncompromisingly react when they are violated". It also said that "large-scale human rights violations" in Ukraine were a cause for concern. Crimean Prime Minister Anatoliy Mohilyov told AFP that local authorities were preparing to "take measures". He did not say what they were. The men, in full combat dress but without any markings of affiliation entered the buildings and removed the guards without any fight, the Interfax-Ukraine news agency quoted sources in parliament as saying. On Wednesday there were scuffles outside the Crimea regional parliament building between thousands of pro-Russia separatists and supporters of Ukraine's new leaders, as regional politicians prepared to debate the removal of Viktor Yanukovich from the presidency. Interfax news agency quoted a witness as saying there were about 60 people inside and they had many weapons. It said no one had been hurt when the buildings were seized by Russian speakers. One, an ethnic Russian called Leonid Khazanov, told news agency Reuters: "We were building barricades in the night to protect parliament. Then this young Russian guy came up with a pistol...we all lay down, some more ran up, there was some shooting and around 50 went in through the window. said 'To make our own decisions, not to have Kiev telling us what to do'," said Khazanov. Not so happy with all this. Strange that I have been playing these scenarios that are part of historic armed conflicts without much emotion really - but now I feel different. Status: offline Here is an example of what I have so far. Status: offline Maybe you should make scenarios based on the news as it happens. Would be cool if you did that regularly. Status: offline I'm not very good at making scenarios; check the other scenarios I've made if you don't believe me. I'd love to collaborate on a scenario with someone (or a group of people); and provide data and imports. Also I need to mention I've used some of Rudd's and Blh's imports in the above attached scenario. Really high quality imports! A group of armed men in military clothes occupied Simferopol airport in Crimea early on Friday, Interfax Ukraine news agency citing eyewitnesses. About 50 gunmen arrived at the airport in three lorries that did not have registration numbers, Interfax Ukraine reported. The men have first surrounded the terminal of domestic flights, but later moved to other parts of the airport as well. The agency reports that the aim of the group is unclear. SIMFEROPOL, Ukraine (AP) — A report says dozens of armed men in military uniforms have seized an airport in Ukraine's strategic Crimea region. Witnesses told the Interfax news agency that the 50 or so men were wearing the same gear early Friday as the ones who seized government buildings in the regional capital of Simferopol on Thursday and raised the Russian flag. The report says the men with "Russian Navy ensigns" surrounded the Simferopol Airport's domestic flights terminal. The report could not be immediately confirmed. The events in the Crimea region have heightened tensions with neighboring Russia, which scrambled fighter jets to patrol borders. Russia also has granted shelter to Ukraine's fugitive president, Viktor Yanukovych, after violent protests in Kiev. 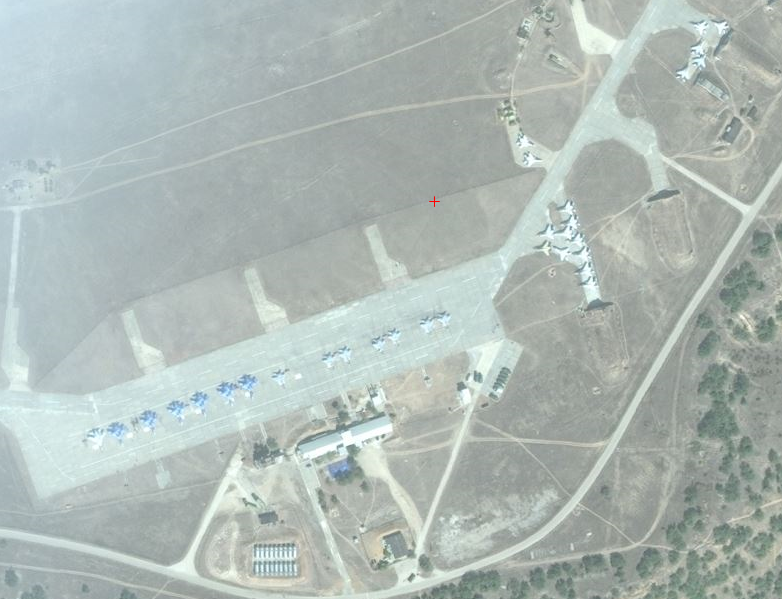 Simferopol, February 28 (Navigator, Victor Orlov) – Simferopol Airport captured by unknown armed men, presumably related to the seizure of government buildings and the Crimean parliament. On this “Navigator” said a source in the Crimean police head office. “Around one o’clock captured Simferopol Airport – the same people. With arms, strong, in the same clothes. The security chief said that his people were politely asked to leave, “- said the agency interlocutor. It is noteworthy that the Crimean police still do not know who are the people who took the main administrative building of autonomy. “We only know that they speak fluent Russian, Caucasian or without Moscow accent,” – said the law enforcement. 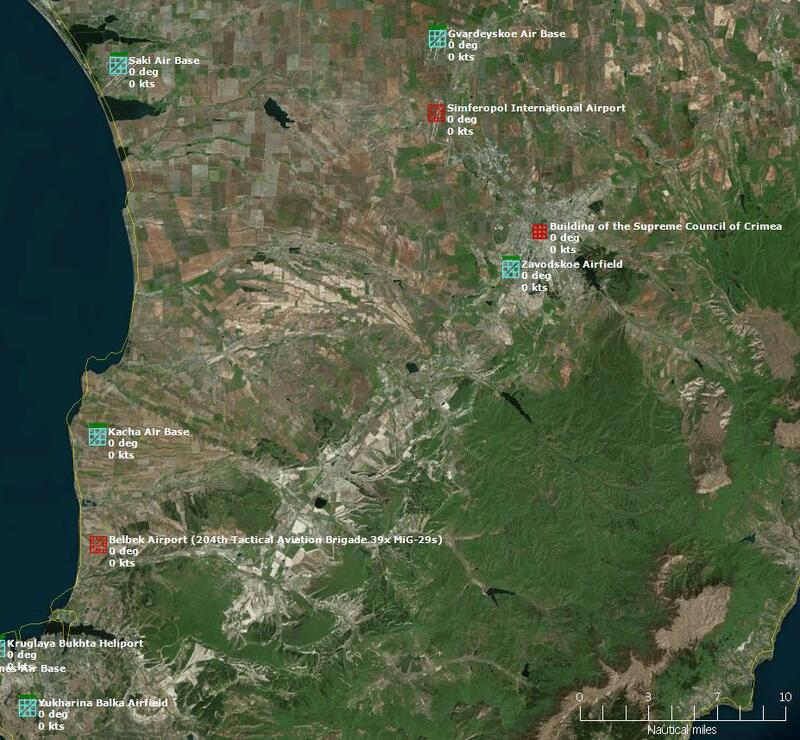 Similar information about the capture of the airport “Belbek” in Sevastopol city portal reported “Civil Defense” . According to the publication, to occupy the airport here were involved 17 Urals and about 300 people in camouflage with a gun. UNIAN is reporting that approximately 6 military trucks full of armed soldiers are currently surrounding the Sevastapol International Airport. The source notes that “unknown armed people in uniform” also surrounded a guest residence normally reserved for senior officials. 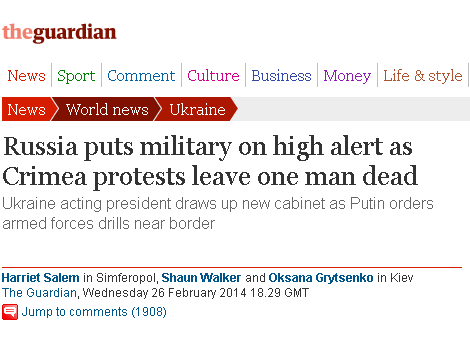 NBNews claims the soldiers to be Russian Black Sea Fleet personnel. Those on the scene were not able to identify the purpose of the soldiers, as they will not answer questions to the press. Local news is reporting that in fact both Sevastopol and Simferopol airports are surrounded, the latter by militants at 1am local time.Interfax and Ukrainska Pravda confirmed these reports, and that approximately 150 armed unmarked soldiers are in the area, dropped off via 3 unmarked Kamaz transport trucks. The airport is still operational. They report that 25 supporters have a Russian naval flag. The soldiers speak with heavy Russian accents. This news comes directly after armed insurgents occupied the Crimean parliament buildings in Simferopol under the Russian flag. 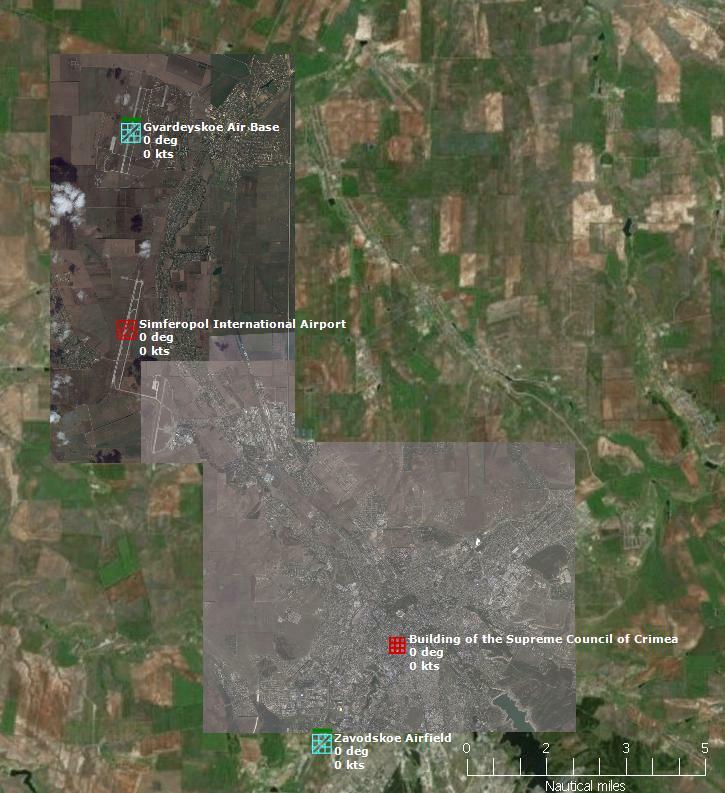 Right now it seems as though Simferopol International Airport, the Building of the Supreme Council of Crimea and Belbek Airport have been seized by unknown special forces. 204th Tactical Aviation Brigade is based out of Belbek Airport; which flies 39x MiG-29s. Armed men who took control of the airport in Ukraine's Crimean regional centre of Simferopol on Friday are patrolling the airport grounds but have not moved into the passenger terminal and appear to be allowing the airport to function normally. A Reuters eyewitness at the scene said the men, dressed in full battle gear and carrying assault rifles and machine guns, were moving freely in an out of the control tower. A man called Vladimir, who said he was a volunteer helping the group, said: "I'm with the People's Militia of Crimea. We're simple people, volunteers ... We're here at the airport to maintain order. We'll meet the planes with a nice smile - the airport is working as normal." He added that though he and other volunteers supported the actions of the armed men they did not know where the group was from. Crimea, the only Ukrainian region with an ethnic Russian majority, is the last big bastion of opposition to the new leadership in Kiev since pro-Russian President Viktor Yanukovich was ousted at the weekend. The region also provides a base for the Russian navy's Black Sea Fleet. Kiev's new rulers said any movement by Russian forces beyond the base's territory would be tantamount to aggression. U.S. Secretary of State John Kerry said Russian Foreign Minister Sergei Lavrov had assured him by telephone that Moscow would not intervene militarily in its neighbor. "We believe that everybody now needs to take a step back and avoid any kind of provocations," Kerry said at a joint news conference with German Foreign Minister Frank-Walter Steinmeier. "We want to see in the next days ahead that the choices Russia makes conform to this affirmation we received today." The United States pledged its support for the new government in a call on Thursday by Vice President Joe Biden to Ukrainian Prime Minister Arseny Yatseniuk. Yanukovich, who fled Kiev after scores of demonstrators were killed last week, was expected to hold a news conference in Russia on Friday. He has declared he is still Ukraine's president, but has lost support even in regions where the ethnic Ukrainian population mainly speaks Russian as he does. Crimea, which was administered as part of Russia within the Soviet Union until it was transferred to Ukraine in 1954, is a more tendentious question. Separatism there has often flared up at times of tension between Moscow and Kiev. A group of armed men in military uniforms seized the main regional airport in Simferopol, Crimea, Interfax news agency said early on Friday. A day before, unidentified gunmen seized the Crimean parliament and raised a Russian flag. The gunmen issued no demands and police hardly seemed to treat the event as a major security incident. Instead, they casually guarded the building while hundreds of pro-Russian demonstrators assembled, including elderly people who danced cheerfully to recordings of Soviet martial music. The regional parliament even managed to hold a session inside the building on Thursday despite the siege, where it voted to stage a referendum on "sovereignty" for Crimea. By the early hours of Friday, police guarding the building would not say what had happened to the gunmen or whether they were even still there. Russia's flag still flew from its roof and lights were on in the windows of its top floor. Oleksander Turchinov, Ukraine's acting president, warned Russia not to move personnel beyond areas permitted by treaty for those using its naval base: "Any military movements, the more so if they are with weapons, beyond the boundaries of this territory will be seen by us as military aggression," he said. Russia has repeatedly declared it will defend the interests of its citizens in Ukraine, and on Wednesday announced war games near the border involving 150,000 troops on high alert. Kerry said Lavrov told him the war games were pre-planned. Although Moscow says it will not intervene by force, its rhetoric since the removal of its ally Yanukovich has echoed the runup to its invasion of Georgia in 2008, when it sent its troops to protect two self-declared independent regions and then recognized them as independent states. Witness accounts suggest those who captured the Crimean parliament building in the early hours of Thursday were pro-Russian gunmen of some kind. "We were building barricades in the night to protect parliament. Then this young Russian guy came up with a pistol ... we all lay down, some more ran up, there was some shooting and around 50 went in through the window," Leonid Khazanov, an ethnic Russian, told Reuters. "I asked them what they wanted, and they said 'To make our own decisions, not to have Kiev telling us what to do'." Ukraine's new interior minister, Arsen Avakov, said the attackers had automatic weapons and machine guns. The regional prime minister said on Thursday he had spoken to the people by telephone, but they had not made any demands or said why they were there. They had promised to call him back but had not done so, he said. With the siege apparently still under way, the regional parliament met in another part of the building and voted to hold its referendum on May 25, the day Ukraine plans to elect a new president to replace Yanukovich. The measure, if passed, would declare Crimea sovereign, with its relationship to the rest of Ukraine governed by treaty. The pro-Russian crowd outside cheered the news. "In three months we will have a chance to choose our future," said Yuri Lukashev, 58, a carpenter standing in a group of other ethnic Russian men outside the building late at night. "We're celebrating our victory. It's a chance for peace in Crimea, guaranteed by Russia." However, elsewhere there was some anger at the invasion of the regional parliament and the flying of the Russian flag. Alexander Vostruyev, 60, in a leather cap and white beard, said: "It's disgrace that the flag of a foreign country is flying on our parliament ... It's like a man coming home to find his wife in bed with another man." Feb 28 (Reuters) - Ukraine's interior minister said on Friday Russian forces had taken control of two airports in the Crimea region and condemned them an armed invasion and occupation. He said there had been no bloodshed or clashes when armed men he described as Russian naval forces took over a military airport near the port of Sevastopol where the Russian Black Sea fleet has a base. Armed men he described as representing the Russian Federation had taken over Simferopol international airport without clashes. "I consider what has happened to be an armed invasion and occupation in violation of all international agreements and norms," Interior Minister Arsen Avakov said on his Facebook page, describing it as an armed provocation and calling for talks. (Reuters) - NATO's top military commander played down tension with Russia over Ukraine on Thursday, saying the Western military alliance had made no plans to respond to any Russian intervention in Crimea and appealing for a peaceful resolution of the crisis. Russian President Vladimir Putin ordered 150,000 troops on Wednesday to be ready for war games near the border of the former Soviet republic once ruled from Moscow after pro-Russian Ukrainian President Viktor Yanukovich was toppled by protests over his rejection of closer ties with the European Union. In addition, an armed group seized government buildings in Ukraine's ethnic Russian-majority region of Crimea on Thursday and raised the Russian flag. "There just isn't any reason for us and Russia to compete over the future of Ukraine. I think that we both want the same thing which is a prosperous, stable, peaceful Ukraine," U.S. Air Force General Philip Breedlove said in an interview with Reuters and The Wall Street Journal. "What we need to do now is just, in a calm way, work this out so that we understand what Russia is doing and how that affects other people in the region," said Breedlove, who is NATO's Supreme Allied Commander Europe and commander of U.S. forces in Europe. Asked if he was concerned about the possibility of a Russian military intervention in Crimea, Breedlove said: "I think everybody might be concerned about that but right now that is not my primary concern." The occupation of the buildings in Simferopol, Crimea was "a troubling situation", Breedlove said, adding: "We, like all the nations of NATO, want to see a peaceful resolution to all of the turmoil in Ukraine." Breedlove said neither the United States nor the 28-nation Western alliance had drawn up contingency plans for how to respond if Russian forces did move militarily in Crimea. "Right now we are not planning contingencies on how to respond here. What we are doing is supporting the peaceful resolution of this business," Breedlove said. NATO had also not moved military equipment due to tensions over Ukraine, he said. "No, no, we have taken no actions to this moment. We are doing what everyone else is doing which is monitoring. We are trying to get to a full understanding of exactly what has transpired," Breedlove said. The United States sent two Navy ships to patrol the Black Sea during the Winter Olympics in Sochi, Russia that ended on February 23. Breedlove said one of these, the USS Mount Whitney, flagship for the Europe-headquartered U.S. Sixth Fleet, had left the Black Sea while the second ship, the USS Taylor, was in port in Turkey, and there were no plans to change their deployment. Breedlove said the Russian "snap exercise" seemed to be one of a series of exercises that has been a new, but not unknown, feature of Russian strategy over the last couple of years. Moscow had informed NATO it would conduct the exercise, he said. "We are watching that as it unfolds now." Breedlove said he had "open and constant contact" with both General Valery Gerasimov, chief of the general staff of Russia's armed forces, and with the new head of Ukraine's armed forces general staff, Admiral Yury Ilyin. Status: offline "Der Spiegel" reports that many of the soldiers who took control of the airports have no magazines in their weapons.